In a previous blog, I wrote about my thoughts on planning an intergenerational worship, a worship that isn’t about being kid-friendly, but about worship for all ages to participate at their comfort and ability level. This last Sunday was Palm Sunday. Traditionally, we have had a Holy Week pageant, which was focused heavily on kid participation. The challenge of this is depending on when Spring Break is we may have 3 kids or 40 kids in worship. In planning an intergenerational worship, I kept it simple, thoughtful, and worked with the choir director to integrate music that would be both beautiful and interactive. You can view pics here. Usually, the pews are in slightly diagonal rows leading up to the chancel. 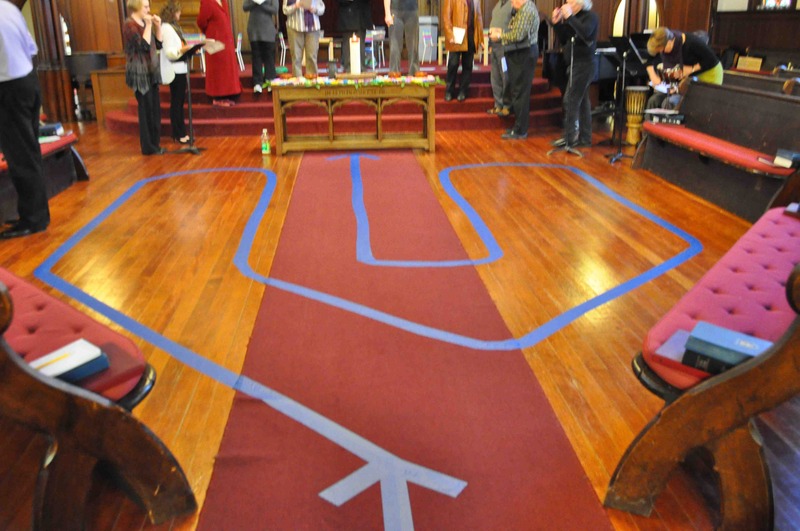 The front pews were removed to make room for a labyrinth, which created a spacious, safe worshipping atmosphere. First-time visitors could still sit in the back if they felt more comfortable to do so and not feel pressured to be too close. 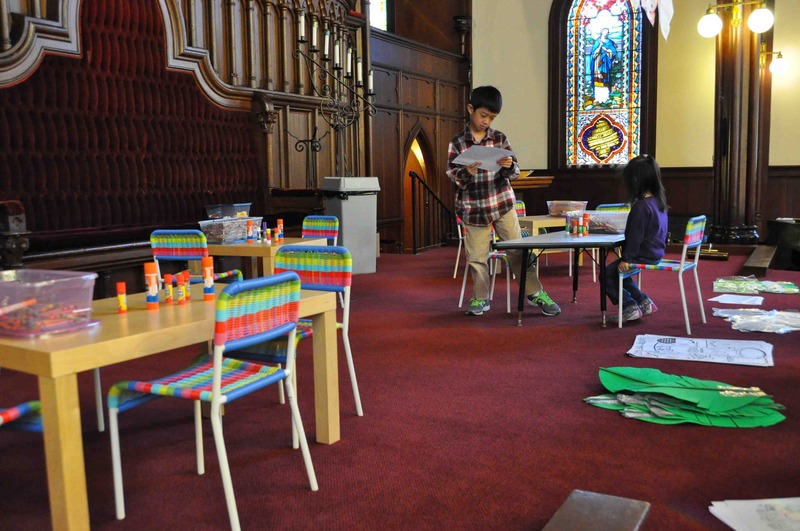 I transferred the chancel area into a space for kids to do crafts and coloring. They made palms. The kids loved having so much space. 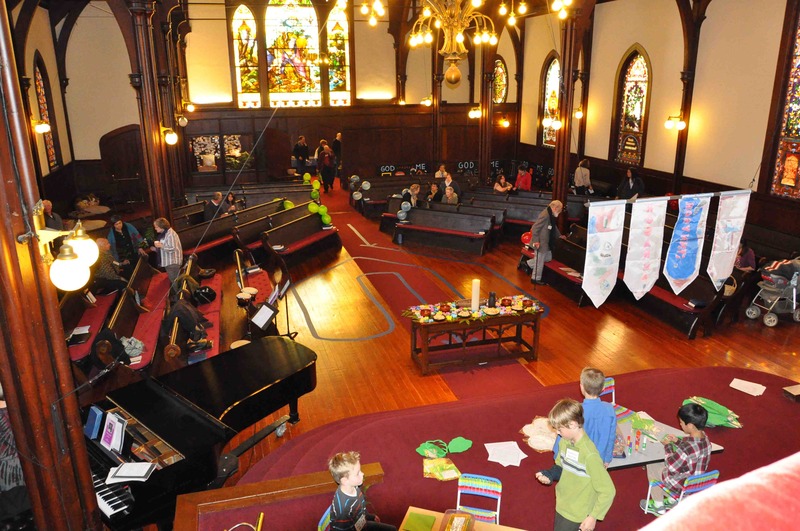 Surprisingly, the congregation said they loved having a clear view of all the kids in the midst of worship. With the help of the choir director, we interwove music, scripture, and story together. The choir did a mixture of call and response, leading the congregation in music, and doing more complicated pieces. 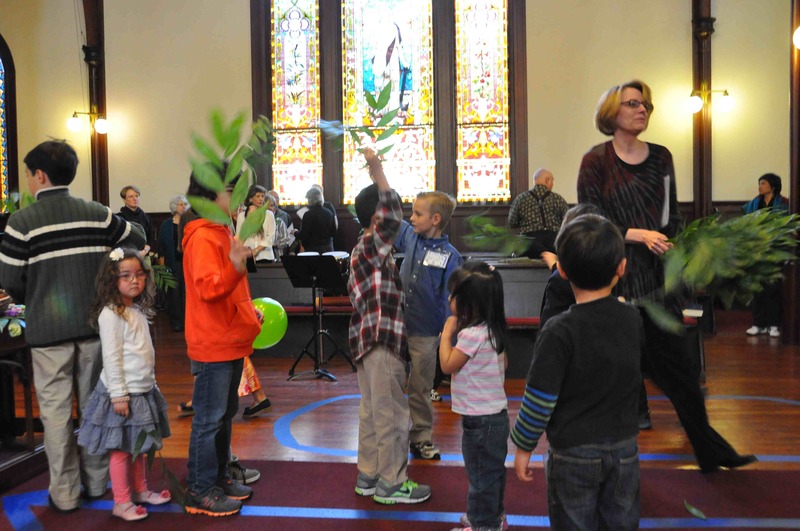 Although it was Palm Sunday, the focus was on the theme “Journey.” We first read the scripture Luke 19.28-40, focusing on Jesus’ beginning journey into Jerusalem. The congregation then read “The Tale of Three Trees,” which is a story about the journey of three trees who had high hopes and had them realized beyond their dreams. I took the story and turned it into a 3 part litany. 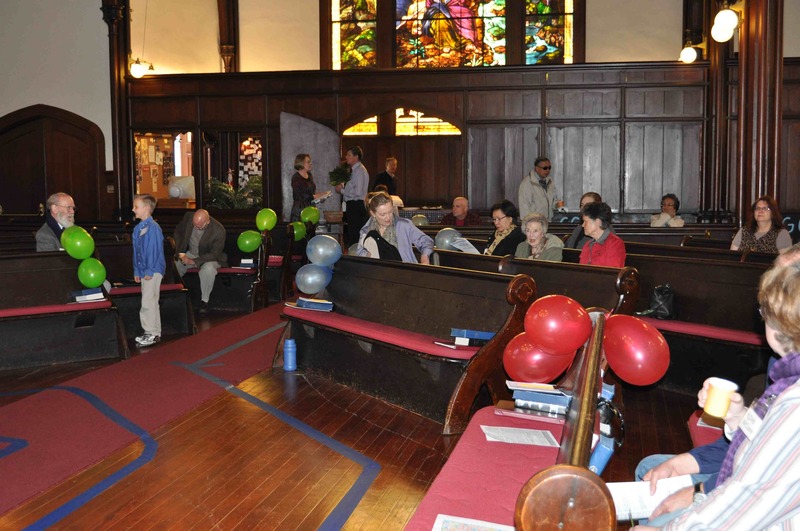 I had the congregation divided into 3 sections and identified with red, blue, and green balloons. Narrator: Long ago in the far away land of Palestine, three trees stood on a hillside overlooking a seaport town. Each three had great hopes and dreams of what it would be when fully grown. 1st Tree: The first tree boasted that it’s lumber would be used to make a great and beautiful treasure chest. The chest would be decorated with bright golden hinges and polished to a fine and shiny finish. Inside it would hold great riches, jewels which were the colors of the rainbow and gold and silver coins. 2nd Tree: The second tree claimed that it would be fashioned into a fine sailing ship. The ship would sail the high seas and travel to far and exotic places. The passengers would be kings and soldiers and statesmen who would marvel at the beauty of such a wonderful ship and the smooth and safe voyages it gave them. 3rd Tree: The third tree declared that it would not be cut down and used by man for any of his needs. This tree would be left standing because of its beauty and strength. People would look at the reach of this tree’s branches and would think of God and all His glory as they gazed upward to the sky. Narrator: Then one day three men with axes came to the hill where the trees stood tall and full. 1st Tree: As each tree stood in anticipation of their fate, the first man approached the first tree. He examined it and decided it was a good tree for his uses and so he cut it down. 2nd Tree: The second man looked at the second tree and assessing its sturdiness and good quality proceeded to chop it down. 3rd Tree: The third man stood looking at the third tree who reached its branches ever upward, hoping he would leave the tree alone to live its days on that hill. However, the third man judged the tree to be perfect for his needs, and cut it down. 1st Tree: Now the first tree that had dreamed of being a beautiful treasure chest was instead made into a manger. It was sold to a farmer who used it in his cave where he kept and fed his animals. From this manger the animals of the farm ate the hay that lay in it. 2nd Tree: Sometime later, the second tree was made into a small fishing boat. Its dreams of becoming a great sailing ship were gone. Now it carried fishermen and the quantities of fish that they caught each day from a small sea. 3rd Tree: The third tree spent many years in a lumber yard until one Friday morning it was yanked out of the pile of lumber it had lain in. It was made into a crucifix and put on the shoulders of a tired man who had been badly beaten. The tree was filled with shame at what it had become a part of. 1st Tree: One night a young woman and her husband came to the cave looking for shelter for themselves and their newborn baby. In that manger, they laid their infant son. It was at that moment that the tree knew that it held the greatest treasure in the world. 2nd Tree: Suddenly a great storm arose and waves rocked the boat back and forth as it tried to steady itself to keep from being wrecked. Then a man raised his hand saying, “Peace” and all was calm around them. At that moment the second tree knew that it carried a man greater than any worldly king and that it sailed a greater adventure than it could ever have dreamed of. 3rd Tree: Then as the man died upon the cross a great storm descended from heaven and the earth shook. At that moment the tree felt the power of God radiating through it. Narrator: Two days later, on Sunday morning the sun rose and joy and warmth filled the air as God’s love changed all that had gone before. 1sr Tree: God’s love made the first tree beautiful. 2nd Tree: It made the second tree strong. 3rd Tree: And each time people looked upon the third tree they thought of God. Afterward, people were invited to think about their own journey and name their journey. They wrote that name on a strip of decorating wax. They were then instructed to walk the labyrinth, warming the wax strip in their hands. 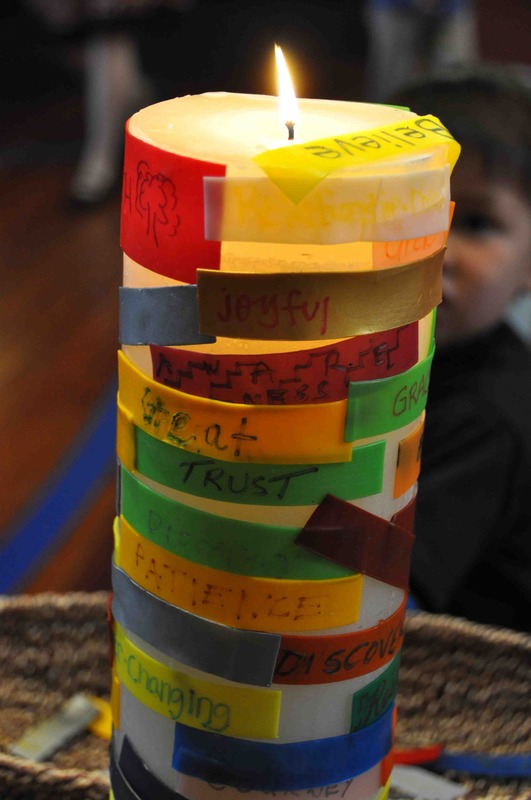 They offered their wax strip as a prayer by adding it to the Christ candle. 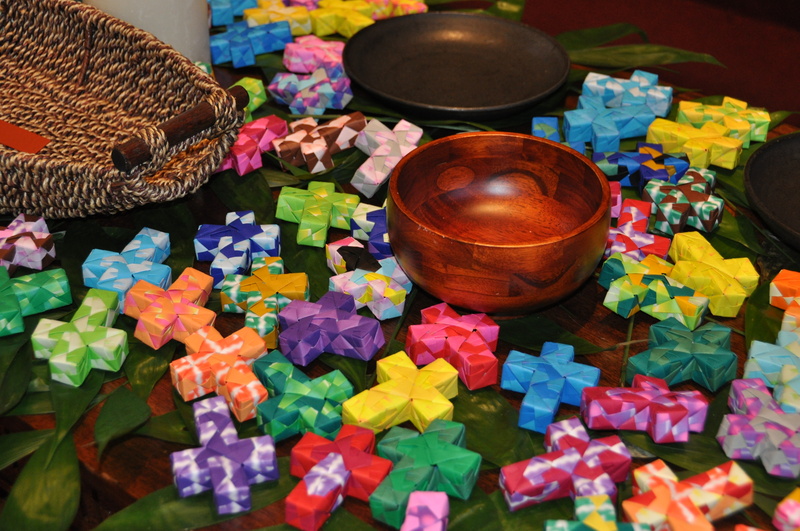 As a reminder of their journey, they chose and took an origami cross to take home with them. 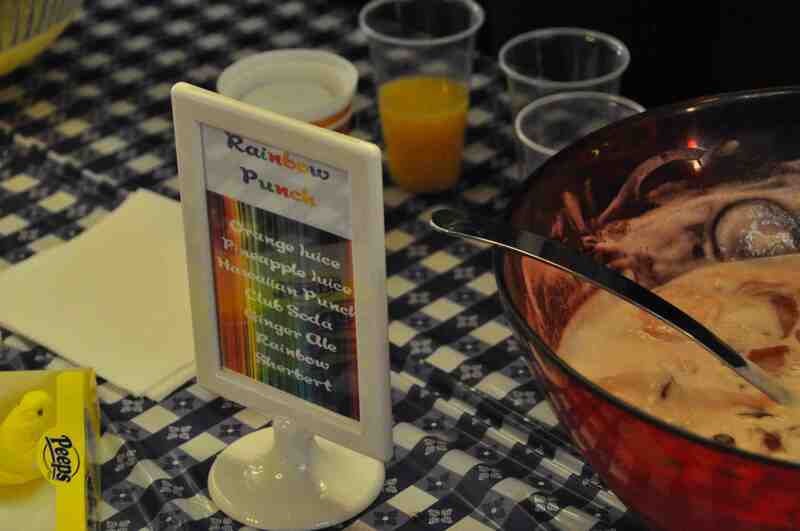 After worship, we set up a spritzer bar, serving Orange Sparkler, Easter Cream, and Rainbow Punch. Whether you are an adult or a kid, everyone loves fancy punch. It was a big hit for all. How did you get the wax strips to adhere to the candle? I love this idea and would like to use it in my campus setting! Some say that you just need to warm it between your hands, but I find this doesn’t make it stiff enough. I or participants actually just run it quickly over the candle flame and it softens enough to stick to the side of the candle. That was my guess, but I wanted to check before I used it! Thanks so much! What were the instructions & materials for the kids to make the palms? Sounds like a great activity that I would love to try out! Hi Joy, it depends what age and ability level you are referring to. There are simple craft ones, you can order from Oriental Trading or you can use real ones like we did on this particular Sunday.